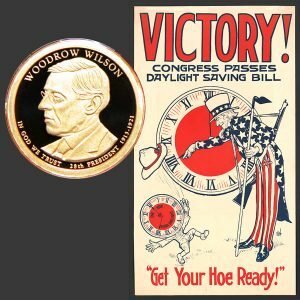 Today, the Woodrow Wilson Presidential One-Dollar Coin remembers when he signed into law the first daylight saving plan on March 19, 1918. Does it really provide the benefits the advocates proposed? President Wilson Approves Bill to Set Clocks Forward One Hour March 31. Washington, March 19. — The daylight saving bill was signed today by President Wilson. It puts all clocks forward an hour on the last Sunday in March and turns them back again the last Sunday in October. The daylight saving plan will go into effect and be observed without the slightest disorganization or impairment of existing conditions. Trains will be run as usual, and every feature of daily life into which the element of time enters will remain unchanged. Before retiring on the last Saturday of this month, the American householder will set his clock an hour ahead, and then may go to sleep and forget entirely about daylight saving until the last Saturday of October. On that date he will reverse the process, turning back the hands of the clock an hour, and the next day the nation again will run on “sun” time. In the summer the American man actually will rise, transact his daily business, and retire all an hour earlier than has been his custom, but with his clock an hour fast he will not know the difference. An hour of daylight thus will be conserved in the afternoon. The plan’s practicability and efficiency have been effectively demonstrated in twelve European countries. A great saving of illuminants, such as oil, gas, and electric power. Increased manufacturing production as the result of improvement in working conditions. General benefits to the national health, because of an additional hour of daylight, which may be devoted to recreation. Reduction in the cost of living to some who can raise garden truck for domestic consumption; and improvement of the training conditions for the fighting forces. “An act (S. 1854) to save daylight and to provide standard time for the United States. “Be it enacted, etc., That, for the purpose of establishing the standard time of the United States the territory of continental United States shall be divided into five zones in the manner hereinafter provided. The standard time of the first zone shall be based on the mean astronomical time of the seventy-fifth degree of longitude west from Greenwich; that of the second time zone on the ninetieth degree; that of the third zone on the one hundred and fifth degree; that of the fourth zone on the one hundred and twentieth degree; and that of the fifth zone, which shall include only Alaska, on the one hundred and fiftieth degree. That the limits of each zone shall be defined by an order of the Interstate Commerce commission, having regard for the convenience of commerce and the existing junction points and division points of common carriers engaged in commerce between the several states and with foreign nations, and such order may be modified from time to time. “Sec. 2. That within the respective zones created under the authority hereof the standard time of the zone shall govern the movement of all common carriers engaged in commerce between the several states or between a state and any of the territories of the United States, or between a state or the territory of Alaska and any of the insular possessions of the United States or any foreign country. In all statutes, orders, rules, and regulations relating to the time of performance of any act by any officer or department of the United States, whether in the legislative, executive, or judicial branches of the government, or relating to the time within which any rights shall accrue or determine, or within which any act shall or shall not be performed by any person subject to the jurisdiction of the United States, it shall be understood and intended that the time shall be the United States standard time of the zone within which the act is to be performed. “Sec. 3. That at 2 o’clock antemeridian of the last Sunday in March of each year the standard time of each zone shall be advanced one hour, and at 2 o’clock antemeridian of the last Sunday in October in each year the standard time of each zone shall, by the retarding of one hour, be returned to the mean astronomical time of the degree of longitude governing said zone, so that between the last Sunday in March at 2 o’clock antemeridian and the last Sunday in October at 2 o’clock antemeridian in each year the standard time in each zone shall be one hour in advance of the mean astronomical time of the degree of longitude governing each zone, respectively. “Sec. 4. That the standard time of the first zone shall be known and designated as United States standard eastern time; that of the second zone shall be known and designated as United States standard central time; that of the third zone shall be known and designated as United States standard mountain time; that of the fourth zone shall be known and designated as United States standard Pacific time; and that of the fifth zone shall be known and designated as United States standard Alaska time. The Woodrow Wilson Presidential One-Dollar Coin shows with an artist’s portrayal of the new daylight saving time, circa 1918.